Heat up some butter in a non-stick frying pan. Once the butter is fully melted and hot, sauté the onions until fragrant and add in the tuna flakes and baked beans. Cook until it is heated through. 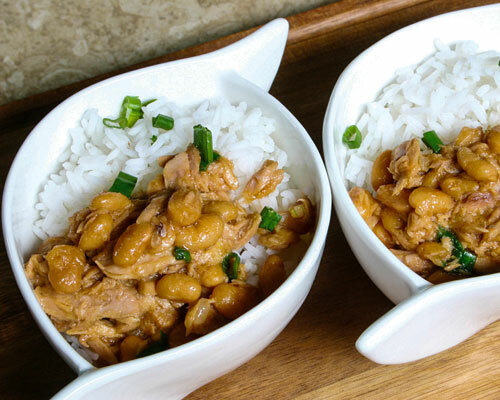 Empty the pan into a bowl and serve the baked beans and tuna with hot steamed rice. Sprinkle with some chopped spring onions. Comments: This delicious blend of tuna & baked beans provides a vast range of health benefits including lowers blood pressure, prevents cancer, arthritis, heart disease. This recipe is loaded with good fats (omega 3 fatty acid) from tuna that helps to maintain higher levels of good cholesterol levels (HDL) compared to bad cholesterol level(LDL) in blood. Also,the high level of manganese from the recipe controls the level of sugar in human blood, thereby preventing diabetes as well as aids bone health. Power on with protein derived from plant (baked beans) as well as animal source (tuna) that is essential for cell growth, muscle growth, strength, tissue repair and recovery and reproduction. Further, one serve of this recipe provides about 19% of our daily intake of iron from baked beans that provide an important source of iron for those who do not eat meat regularly.